In Jim Shepard’s short story “Your Fate Hurtles Down at You,” a group of men in Switzerland call themselves the die Harschbloden: the Frozen Idiots. They are part of a federal government commission to study avalanche defense measures in the Alps, and they risk their lives by living in the avalanche zone to prevent the deaths of the villagers below the summits. At the end of a long day, they tell legendary avalanche stories that have been told and retold for generations. 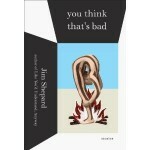 The narrator believes they tell these stories because “there’s much to be learned from such narratives, particularly when the phenomena described have been confirmed elsewhere.” The same could, and should, be said for the stories in Jim Shepard’s new collection You Think That’s Bad. The stories range from 15th century France to post-war Japan, from the dangerous summits of the Himalayas to the rainforests of Papua New Guinea. But no matter when or where the stories in the collection take place, the reader can rest assured that the phenomena described has been confirmed elsewhere if the three page index of sources Shepard acknowledges at the end of the book is to be believed. In Shepard’s masterful hands the stories in this collection do not merely dramatize historical events. Rather, Shepard attempts to discover why people—usually men and told from their 1st person point of view—insist on destroying what they value most and valuing most what they inevitably destroy; whether they are a Japanese special effects wizard, a covert “black world operative,” a physicist working with the Hadron Collider particle accelerator, or a Dutch water management specialist attempting to save Holland and his family from the inevitable storm surge that will inundate his low-lying country. The protagonists in these stories are men divided against themselves; passive to the point of self-destruction, but fully aware of their own passivity. As the wife of the physicist narrator in “Low-Hanging Fruit” says the night before he leaves for Geneva, “the reality you think you observe doesn’t have much to do with the reality that’s out there.” The characters in Shepard’s stories are constantly searching for a better version of themselves in their careers, obsessions, and in their attempts to excise their often painful pasts. Shepard is a master of subtext and tension is found on every page of the book as the protagonists desperately search for what they can never find, while the reader understands that they have taken for granted what they have—typically a loving wife and family—and what could offer the very salvation they seek. Like the alpine-obsessive protagonist in the stunning final story of the collection “Poland is Watching” admits, he needs to climb Nanga Parbat, one of the world’s most dangerous summits, because “the mountains seemed to us another chance, our attempt to understand ourselves and exorcise those aspects we detested. To become the sort of person we could begin to respect.” But the imperfect communication he keeps with his wife and daughter from base-camp and in flashbacks makes it clear that he need not travel so far to find himself. Stories about a special effects guru on the Godzilla film series, a black world operative keeping a lifetime’s worth of professional secrets from his wife while revealing her deepest secret to a colleague, and Freya Stark, the famous adventurer and first Western woman to travel deep into the Arabian deserts, may seem gimmicky to the uninitiated, but rest assured that the stories in You Think That’s Bad are anything but gimmicks. No detail of landscape, back-story, or theme is utilized for any other purpose than creating depth of character and a resonance that rings true well after the book is closed. There are no easy answers for the men and women inhabiting Shepard’s world and the stories in You Think That’s Bad are no exception. Like the boy servant to a macabre and dangerous 15th century nobleman writes in his confession in “Classical Scenes of Farewell,” these stories can read like a chronicle of “one misfortune to another.” But the conflict, humor, tension and pathos that Jim Shepard develops in each story achieves what no amount of research could, unearthing a world that is both oddly familiar and beautifully strange—a world that I wanted to stay in, if at least for one more page.